Divinely decadent, the warm chocolate pudding at Max Bar and Restaurant on Hardware Lane, is worth the 20 minute preparation time. The moist and delicate pudding is drizzled with a rich chocolate sauce of which more is hidden inside, oozing out upon the first bite. 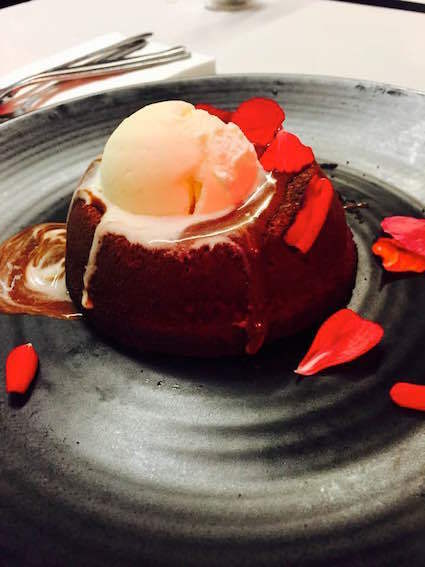 Accompanied with a subtle vanilla bean flavoured ice-cream, and decorated with delicate fragrant edible rose petals, this chocolate pudding is a must order dessert. Pre-book a table outside to enjoy the serenade of the duo guitarists who regularly perform on Hardware Lane. A perfect venue and shared dessert option for a romantic dinner date or just to spoil yourself.